Let Fugoo hitch a ride on your next mountain bike trip, backwoods hike, or kayaking adventure. 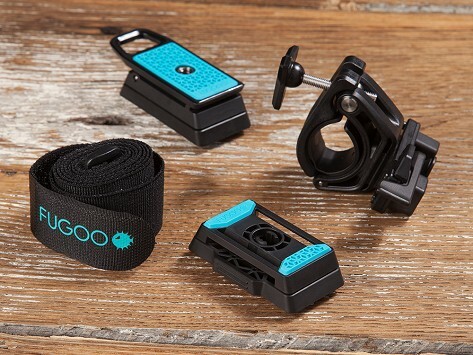 A self-fastening strap and a quick-release spring clip lets you mount Fugoo Sport or Fugoo Tough speakers to railings, handlebars, trees, poles, a tripod, your dog, or almost anything. Dimensions: 2.2" x 1.2" x 0.6"
You like to have your music with you everywhere you go. Fugoo makes waterproof, portable speakers sturdy enough to go along with you. Bluetooth-enabled speakers that can withstand a little rain . . . or being submerged for 30 seconds. Speakers that don’t fear mud, sand, snow—even a six-foot fall. Gary Elsasser’s old speakers had experienced at least some of those. He’s the CEO of Fugoo and a Co-Founder. He also has a boat and two young kids. The result? A lot of portable speakers that ended up rusted and ruined. He made it a mission to make great-sounding speakers that are tough. Each Fugoo speaker comes encased in a protective cover based on how rugged you need it to be, ranging from a night on the patio to a rafting excursion. Some models can be mounted—on rails, handlebars, poles, even tree branches—with the optional Mount Pack. And in any setting, the Fugoo delivers highs, beefy bass, and an environment-filling, 360-degree sound—all for 40 hours, on one charge. Wherever you want your music, Fugoo is up for the challenge.